The period of the early rock and roll era of the 1950s and early 1960s may have been the most prolific for Jewish songwriting couples. Aside from male writing teams like Lieber and Stoller and solo writers like Doc Pomus, there were boy-girl teams like Jeff Barry and Ellen Greenwich, Barry Mann and Cynthia Weil and, most certainly, Gerry Goffin and Carole King. One notes that the male’s name always preceded the female’s. The concept of a lady songwriter was generally dismissed as that of a lightweight by critics. But Greenwich, Weil and King proved the critics wrong. Indeed, some of the biggest hits of the era proved to be from the pens and keyboards of these lady composers and lyricists. For kids growing up in the 1970s, Carole King’s “Tapestry” album was the pivotal album of independent women and a testament that relationships and feelings went far beyond “He’s So Fine” and “Some Kind of Wonderful.” The fact that it stayed on top of the charts for the better portion of two years gives credence to its staying power. Yet, more important than its heartfelt and popular songs was the emergence of this gifted songwriter into a performer of great worth and talent. Before she became the ultimate Earth mama, King had endured a troubled upbringing, emerging from a broken Jewish home in Brooklyn to begin penning love songs for a Broadway firm at the tender age of 16. As the book by Douglas McGrath explains, she was a prodigy who, despite classical training, yearned to be a writer of popular song. Music came naturally to the precocious teen, but the words for her songs she found much more daunting. The mark of a truly gifted actor is an innate ability to take on the role, but at the same time to find their own persona in it. Only a select few know exactly how Carole King talks, but everyone knows precisely how she sings. It was important to the producers of “Beautiful: The Carole King Musical” that the star of the show carry off the physical similarities to King, but also mimic King’s style so as to give a truly accurate performance. In Jessie Mueller one finds a rare commodity on Broadway – an actress with a truly beautiful voice who not merely emulates her subject, but adds her own vocal twists and turns that enhances the live performance and makes it her own. When she plays King as a struggling teen, there is a tentativeness and uncertainty in her demeanor. When she portrays an older mother raising her children while at the same time trying to eke out a career as a songwriter, she exudes confidence. And another key element to enjoying the show is Mueller’s impressive piano skills. She is not merely sitting at the piano pretending to play; she is actually producing the notes and stylings of King while maintaining her character and working with the full orchestra accompanying her in the pit. This is clearly an advantage most Broadway leading actresses lack and could very well be key (pun intended) as to why she won that coveted Tony Award. 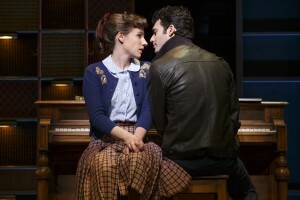 At the beginning of the run of “Beautiful: The Carole King Musical,” King herself indicated a reluctance to see the musical based on her early married life to lyricist and partner Gerry Goffin. (Goffin died just last month at the age of 75.) Even after these many years, the relationship with her first husband was still so very painful to her that she, at first, avoided seeing the show. It is laudable, however, that she did overcome her anxiety and witnessed for herself the outstanding performances by Mueller and Jake Epstein, who plays Goffin. The actors succeed in capturing the emotional roller coaster ride of the songwriting team’s married life in gut wrenching ways. When King finally did stop by that performance two months ago, she expressed feelings of thanks and seemed able to cope with the very private portions of her life. She even accompanied Mueller to the Tony Awards ceremonies, where Mueller received a Best Actress in a Musical nod. Also to be given kudos for great singing and comedic timing are Jarrod Spector and Anika Larsen, who portray competing songwriters Barry Mann and Cynthia Weil. That competition between Goffin and King and Mann and Weil is a critical component to McGrath’s book. Pitting the two couples against each other is the design of music impresario Don Kirschner, who is gingerly played by Jeb Brown. While all of the supporting players – including a cast of talented performers who portray the Drifters, the Shirelles and a host of others from the era – are good enough to move the plot along, the focus of the musical rests squarely on the shoulders of Mueller and her effective channeling of King. The songs by King (and Goffin) play well and follow successful hits by Mann and Weil, who, as the musical shows, also moved their partnership into a marriage. Whereas Goffin and King got married a bit too early, Mann and Weil avoided the trappings of advancing into a marriage for the sake of their careers. These songs speak for themselves as touchstones from the era. A medley of hits from the 1650 Broadway building may not be exactly like the fabled Brill Building, where other Jewish songwriters and performers hung out and churned out hit after hit. But it is remarkably similar. “Will You Love Me Tomorrow,” “Up on the Roof,” “On Broadway,” “The Locomotion” and “One Fine Day” are but a few of the songs given an opportunity to shine with nice choreography by Josh Prince. Scenic design by Derek McLane and costumes by Alejo Vietti also enhance the vocal performances greatly. The second act shows the young couple spinning out of control and out of love as Goffin begins to suffer from the ravages of drug abuse and mental illness, forcing his young bride to have to grow up in a hurry. Mann expresses his love for Weil, but she is reluctant to ruin a successful songwriting team with the prospect of an unhappy marriage. Eventually, that too is resolved. When the final, classic songs from “Tapestry” are heard – “It’s Too Late,” “You’ve Got a Friend,” “(You Make Me Feel Like) A Natural Woman” and “Beautiful” – the audience has taken a journey with King to a place where her insecurities are broken down and she begins to shine as a solo performer. The word on the show had been positive and upbeat even before the Tony Awards. Following Mueller’s Tony Award, the musical has been establishing new records at the Stephen Sondheim Theatre, playing to standing room only audiences. With the highest gross ever seen there, tickets are extremely difficult to get, but are highly recommended. Ticket prices for “Beautiful” range from $99.00 – $169.00 and are available for purchase via Telecharge.com or by calling 212-239-6200. Additionally, they may be obtained in person at the Sondheim Theatre box office. 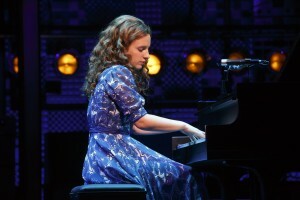 “Beautiful: The Carole King Musical” plays at the Stephen Sondheim Theatre, 124 W. 43rd Street, Tuesday through Thursday at 7:00 p.m. and Friday and Saturday at 8:00 p.m. Matinees are held Wednesday and Saturday at 2:00 p.m. and on Sunday at 3:00 p.m.